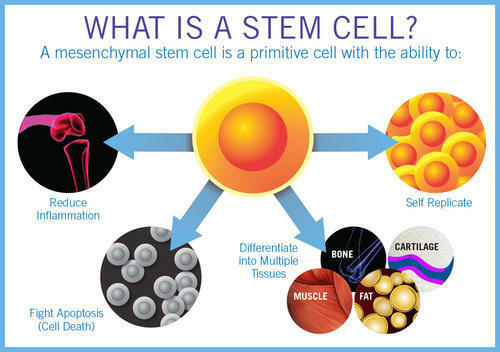 How Does Stem Cell Therapy Help Heal the Body? Our body’s stem cells are responsible for healing us. However, as we age or sustain injury, we sometimes cannot get enough of these healing cells into the injured area. Stem Cell Therapy solves this problem by harvesting the patient’s own cells and then injecting them directly into the area in need. These cells can assist in the healing of damaged tissue, tendons, ligaments, cartilage and bone while decreasing downtime and avoiding painful rehabilitation periods typically associated with surgery. SAME-DAY STEM CELL PROCEDURE: In the morning, bone marrow samples are taken. Later that day, stem cells are introduced into the injury site.We in our center combine stem cell therapy with comrehensive prolotherapy , this combination augment effect of Stem cells ,many folds.